I am trying to work on my running (slow jogging really) so I can improve my triathlon times. As you know the run segment of my triathlons are like a huge battleship anchor dragging the swim and bike segments under the water like they pissed off the mob. So I am doing the couch 2 5k program to help me to get up to speed and keep me one track. Otherwise I would just slack off on the run workouts like I always have. I have been having some issues with my shin muscles getting really tight and making me slow way down. I found some good stretches to do to help me with it but I wanted to see if I could get some inserts for my shoes. At some point (years ago) someone told me that I overpronate and needed motion control. I thought maybe I could use an insert that would increase the motion control. Anyway, I got to Fleet Feet in Charlotte because they are serious runner people and will know what I need. The guy did the whole shoe fit process where I had to walk and jog barefoot. Turns out I have a teeny bit of pronation and collapsing arches. The shoes I bought on a wicked deal at the end of last season (and are big motion control shoes) are causing some of the issues. CRAP! This also means......you guessed it.......new shoes needed. Fantastic! I tried out a few pairs of shoes that the guy brought me and ended up with Brooks Dyad 6 running shoes. They are a neutral shoe which good because I could then add an insert that gave me a little more control and fixed the collapsing arch issue. So far they are feeling pretty good. I am hoping that the new shoe setup and the stretches eliminate the shin tightness so that I can continue to suffer as I work at the run. I am hoping to be able to jog the whole 5k of my 1st sprint triathlon at the end of March. Wow, I just realized how long it has been since my last post. I have got to get better at posting more often. I have some good news that I am very excited about. I just ordered a Trek/Gary Fisher Tarpon mountain bike and didn't have to pay one dime for it. How awesome is that? My company has a program where you can earn points for going above and beyond your normal duties. For instance, I helped with a migration of a site over a weekend and it all went very well and was given points. 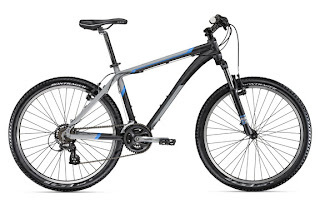 I finally decided to use my points and went looking through the huge list of awards you could get and decided on a mountain bike. We have great trails in this area and I know a few people that ride them. I decided that this would be a good add-on to my training. I am still training for LIVESTRONG Davis CA event and the WAM 300 event which are both in July. I am also planning to do several sprint triathlons this year. I signed up for two of them so far. The first one is at the end of March and the second is in May. My workouts are going very well so far. I have started doing the couch 2 5K to help me fix my non-existent run abilities. Now all I need to do is find a pool to swim at. Last year I was able to swim in my sister's pool but they are going to be moving soon so that is gone now. I am looking at one but I need to figure out all the costs and make sure it fits the budget. Meanwhile, I will be waiting for my new mountain bike which should ship next week.